It is no longer news that corruption is eating deep the fabric of Nigeria across its economy with highest percentage taking place in government contracting processes. This development has of course, caused the country not to be where it ought to be as giant of Africa and most populous black nation in the world. Before now, successive governments had tried to address this cancer worm with little or no genuine achievements recorded. In fact, some went as far as establishing anti corruption agencies and Public Procurement Act (PPA) to deal with the menace but eventually turned to political weapons to fight or suppress perceived enemies. Now, in other to make contracting processes more transparent in Kaduna state, the state government under the administration of Governor Nasir El-Rufai with the help of the state assembly has painstakingly domesticated the Nigerian PPA and come up with a procurement law that provide punitive measures for offenders once convicted. 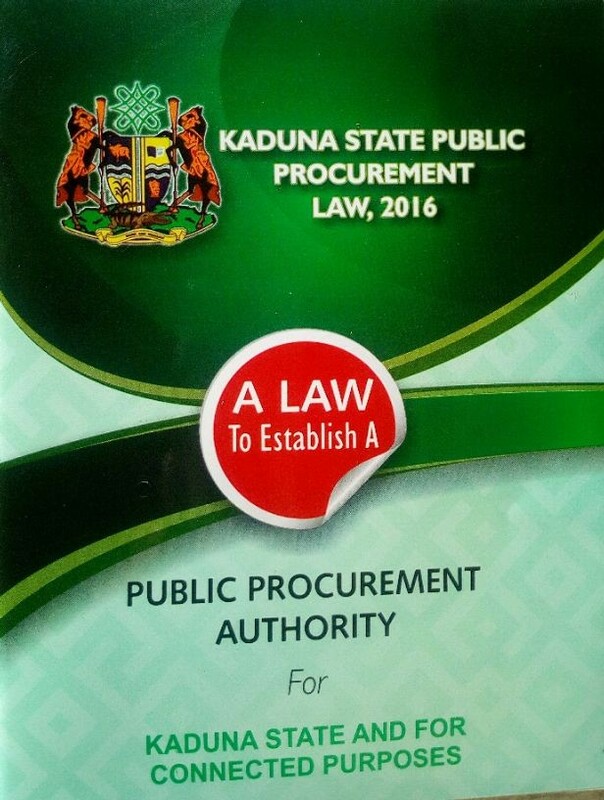 This law known as Kaduna State Public Procurement Law (KADPPL) 2016, procurement experts believed will check corruption in Kaduna state especially as regard procurement. The Law has 71 sections and further breakdown into five parts. Part one covers the PPL and modern approach to procurement, part two discusses strengthening integrity in procurement, part three presents the features of the PPL, part four discusses procurement cycle while part five offers framework contracting. It will have impact on common man because it provides for fair competition which will lead to value for money. For example, if we have strong companies coming to bid for contract advertised by Kaduna State government, there is opportunity to get the best among them. With this, there will be more money in government covers. Punishment upon conviction, for example, non-public officer will be sent to prison not less than a year with option of N500,000 fine. Public officer will bag five years imprisonment without option of fine and summary dismissal. Also, any legal person (company) will be debarmed (blacklisted) for not less than 10 years and a fine not more than the full value of the procurement while every director of the company is liable to a term of improvement of not less than two years or a fine of N2 million. It is against this background that a 3-day sensitization workshop on the better understanding of the contents of the KADPPL by Kaduna State key ministries, departments and agencies (MDAs) and service delivery partners was organized at a hotel in Kano, Kano State North West Nigeria recently ahead the full enforcement of the law. During that workshop, an expert in procurement and Law lecturer who championed discussions, Kinsley Tochi Ude strongly believed that, the state will stand tall in checking public corruption if the law is adhered to. On transparency he said, “PLL of Kaduna State has already made provision for how procurement should be done. It provides for open competitive bidding as default procurement. This in the sense that, procurement opportunity and intended government project will first be advertised. “So, anyone with capacity and interest can submit bid. Now, bids will be submitted in sealed envelopes and tampered-proof boxes that cannot be accessed until the day of bid opening which will be done in public glance. “At the bid opening, bid submitted will be brought out, each of them will be announced with details of the bidder. All the representatives will witness and follow as announced. Criteria must have been given in the advertisement because others have the right to know how the winner emerge and where not satisfied, he they can write to accounting officer. “But if not addressed within a reasonable time, 21 working days, it can be taking to Kaduna State high court. This will serve as deterrent to anybody that will want to go contrary to the rules. So with that mechanisms already in place, you cannot bring your brother who did not participate in the bidding or revealed others’ bid document to him because everybody submitted sealed envelope inside tampered-proof box”, he narrated. “We have been operating edicts that established the Bureau of Budget Implementation and Price Intelligence. And that gave us a foothold to be able to capitalise on the law that now came and authority that is invested by the law on the public procurement”, he said.